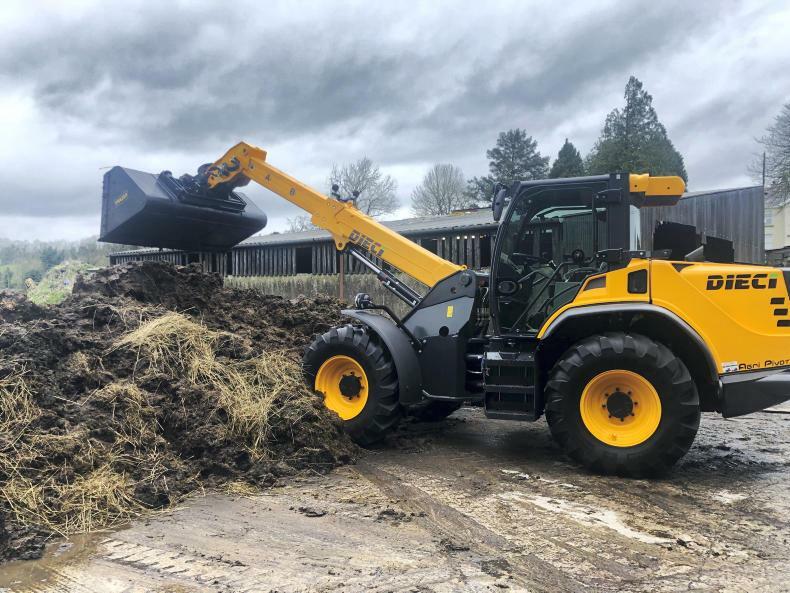 When it comes to making pit silage, contractors know that it’s as important to have a good loader on the pit as it is to have a good harvester in the field. 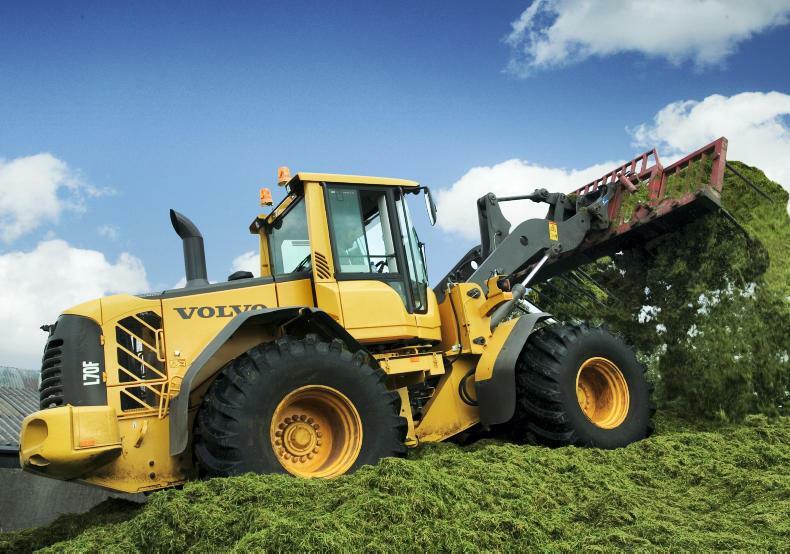 Modern high-throughput agricultural contracting outfits need a wheel loader capable of shifting a large volume of grass. Contractors will have varying preferences, whether it be power-to-weight ratio, four cylinders v six cylinders, and some might prefer a smaller nimble 10t machine over a 14t or 15t one. 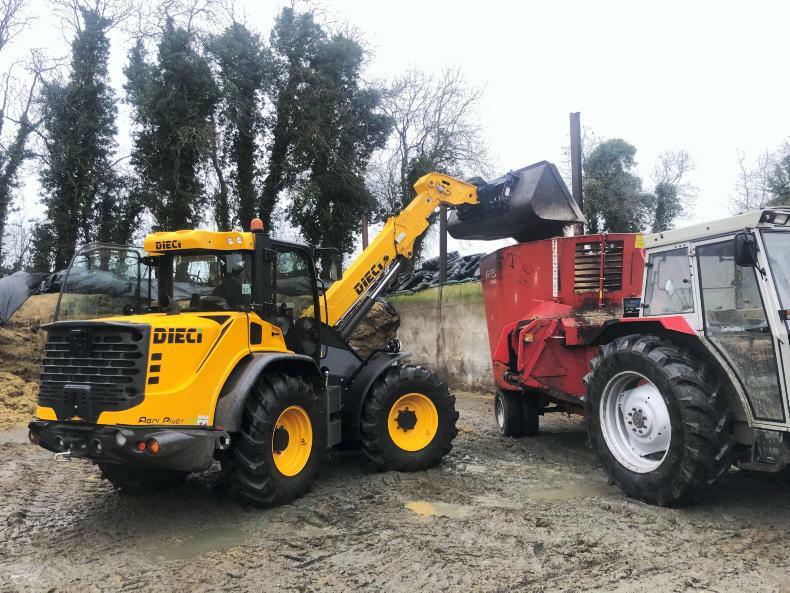 In this article, we take a look at what loaders are available on the Irish market and how they stand up to one another on specification and price. 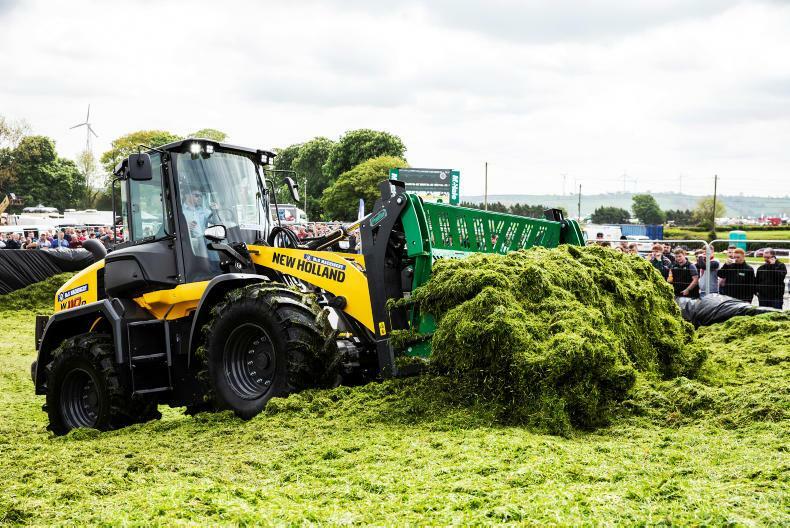 Imported and distributed in Ireland by ECI, JCB has three main offerings in the silage loader bracket for contractors, namely the 419s, the 427s and the larger 435s. 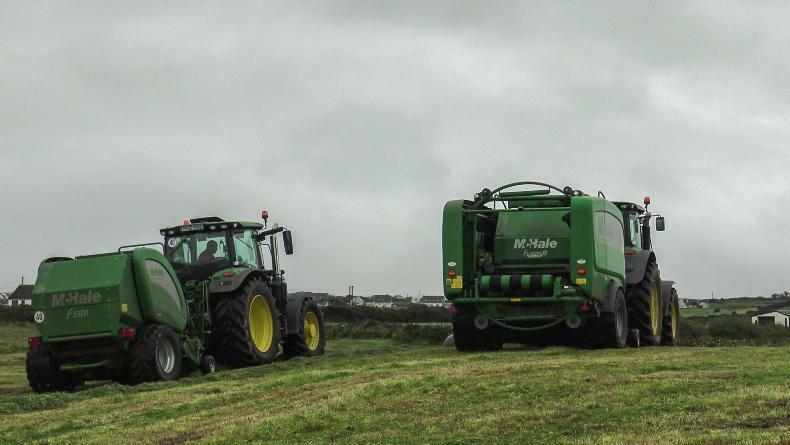 The British-built machines have been very popular in Ireland among farmers and contractors for many years. The 230hp JCB 435s has a list price of €175,000 plus VAT. The three agricultural contractor loader models mentioned above are all powered by 6.7l Cummins engines, have ZF transmissions and axles and Rexroth pumps. Through the years, JCB has always been fond of producing a high power-to-weight-ratio machine, and based on current offering this fact has not changed. JCB has been the market leader in sales of wheel loaders to Irish contractors for the past number of years. Although still a relatively unheard of name in Ireland, Weycor has a strong history of manufacturing wheel loaders through the years under the Atlas Weycor name. This 215hp Weycor AR250e wheel loader has a list price of €155,000 plus VAT. 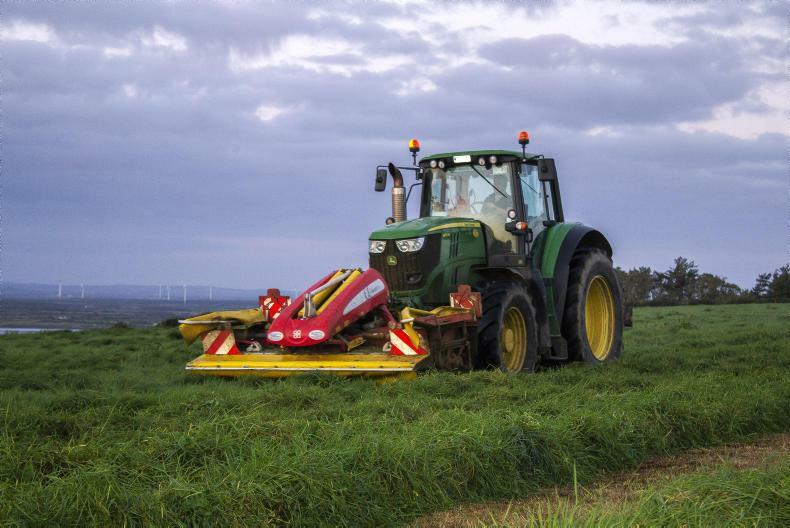 First imported into Ireland last year by Seamus Vaughan Agri in Co Cork, the firm has confirmed to the Irish Farmers Journal that it has already sold one of the flagship models, the AR250e, which will be used for pushing silage. The AR250e is powered by a 6.1l Deutz TCD engine. This water-cooled six-cylinder in-line engine has a power output of 215hp and meets the latest Stage IV emission regulations. Weighing in at 13,900kg, this loader is fitted with Bosch Rexroth pumps. Built in Italy, Venieri machines are imported to Ireland by McCarthy Plant and Agri in Co Cork. 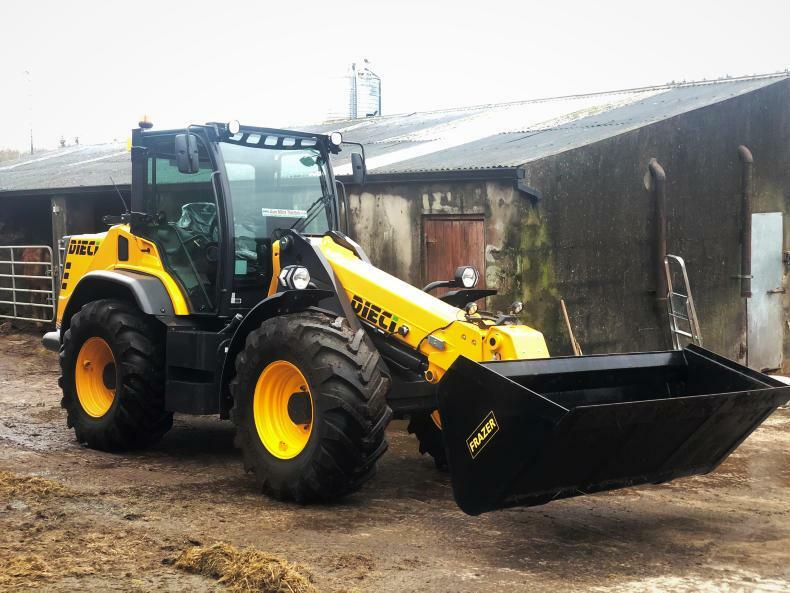 The Veneiri 11.63B is the most common wheel loader in the range used for pushing silage in Ireland. The loader is powered by a four-cylinder in-line turbocharged common rail engine capable of producing 164hp. The 164hp Veneiri 11.63B has a list price of €125,000 plus VAT. 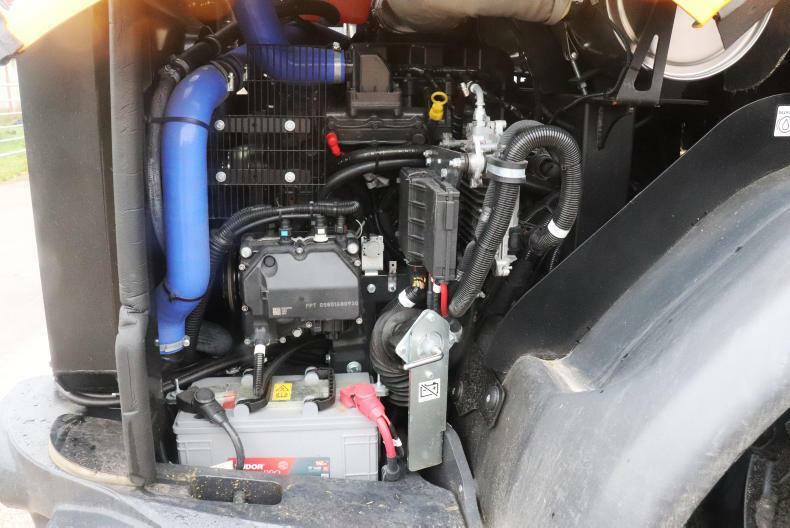 This 4.1l Deutz TCD engine is in accordance with the latest Stage IIIB/Tier4i emissions regulations. The 11.63B is equipped with a hydrostatic transmission with automatic power regulation. The transmission has three forward/reverse speeds with fully automatic gear shift and single-lever control. The loader has a maximum permissible weight of 13,450kg. 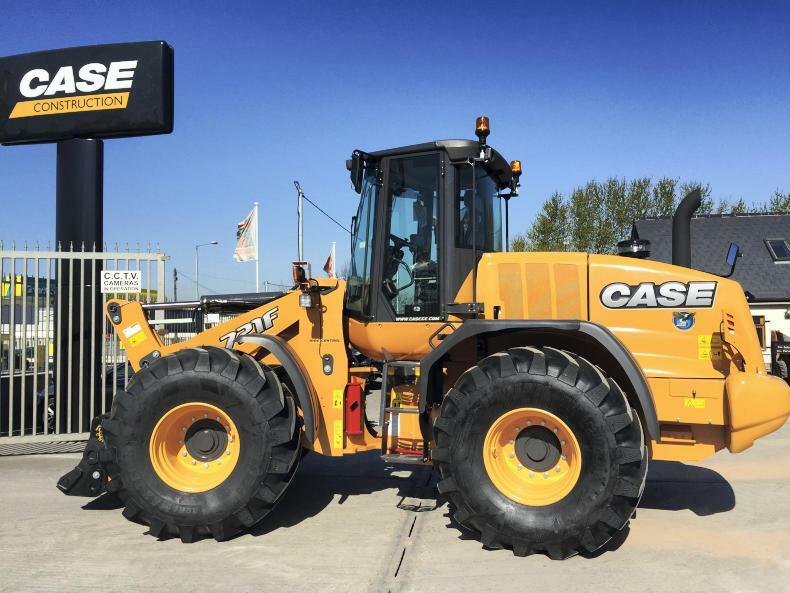 Case wheel loaders are imported and distributed in Ireland by Jim Macadam Equipment Ltd, based in Dublin. The Case 721G is the model favoured by Irish contractors. This wheeled loader is powered by a six-cylinder 6.7l FPT engine that churns out a sizeable 195hp. It is fitted with a five-speed transmission with lock-up torque converter that provides a travel speed of up to 40km/h. The 195hp Case 721G is the model favoured by Irish contractors. It has a list price of €168,000 plus VAT. The loader is equipped with heavy-duty ZF axles with differential lock and wet multiple-disc brakes. Maximum hydraulic oil flow is 206l/min. The wheel loader is four-wheel drive and weighs in at a hefty 15,450kg. Widely used across the construction industry, the Komatsu brand established itself as a well-built capable silage loader back in the mid-2000s. 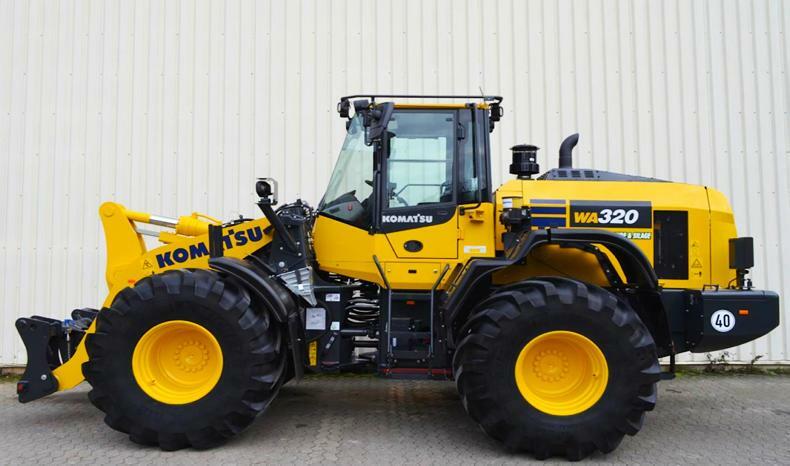 Imported and distributed in Ireland by McHale Plant Sales, Komatsu released its lasted model of the 320 loader last year, the WA320-8. The Komatsu WA320-8 is powered by a turbocharged air-to-air after-cooled diesel engine, providing an output of 170hp. It has an operational weight of 15,500kg. The 170hp Komatsu WA320-8 wheel loader would cost you €168,000 plus VAT. The latest model has an extended engine oil service interval from 250 hours up to 500 hours. An inching pedal allows the operator to take control of travel speed and hydraulic speeds, according to Komatsu. By pressing the inching pedal, pump flow to the motors will decrease, reducing the ground speed and allowing the operator to use the accelerator to increase flow to the equipment hydraulics. Claas first launched a range of wheel loaders suitable for agricultural contractors in Agritechnica back in 2017. 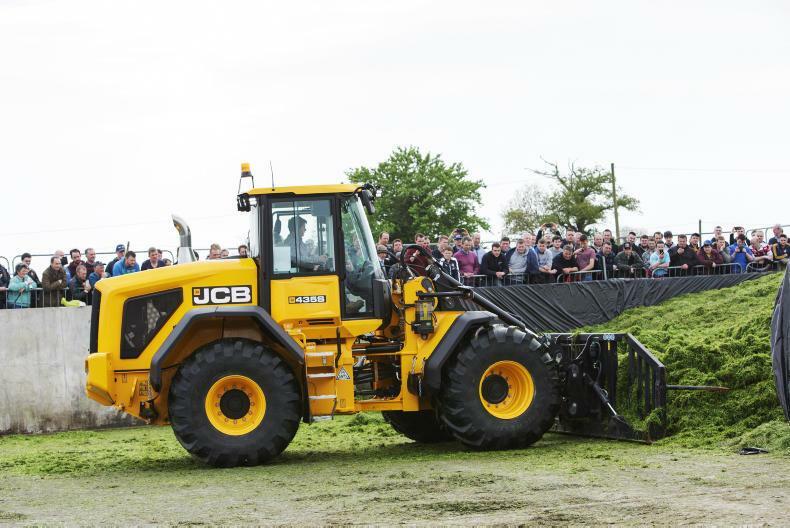 Since then, the first Irish sighting of these loaders was at the Grass & Muck event held at Gurteen College last May. The 155hp Class 1410 wheel loader has a list price of €199,500. The Torion is a collaboration with Liebherr, the German crane and loader giant. The range includes 10 models with load capacities from 3.45t up to 12.4t. The Irish Farmers Journal understands that the 1410 model will be going on a demo tour around Ireland this summer. It is powered by a four-cylinder Deere Power Systems (DPS) engine capable of turning out 155hp. This loader has a tipping load capacity of 9,100kg and an operating weight of 13,900kg. Its 40km/h VariPower hydrostatic transmission features three ranges: 0–6km/h, 0–16km/h and 0–40km/h. Number-wise, the W170D is the most popular contractor-spec wheel loader that New Holland sell in Ireland. New Holland introduced the updated W170D to the market back in March 2017. The wheel loader is powered from a six-cylinder 6.7l FPT engine capable of churning out 197hp. The 197hp New Holland W170D wheel loader has a list price of €221,839. This machine features a 45km/h Ecoshift five-speed powershift transmission, with a torque converter. Other updates to the loader include larger 26in wheels. It’s also equipped with heavy-duty ZF axles. There is no shortage of weight either, with the loader tipping the scales at 14.8t. Maximum hydraulic oil flow is 206l/min. Imported and distributed in Ireland by Pat O’Donnell, Volvo has established itself as a key player in the wheel loader market. 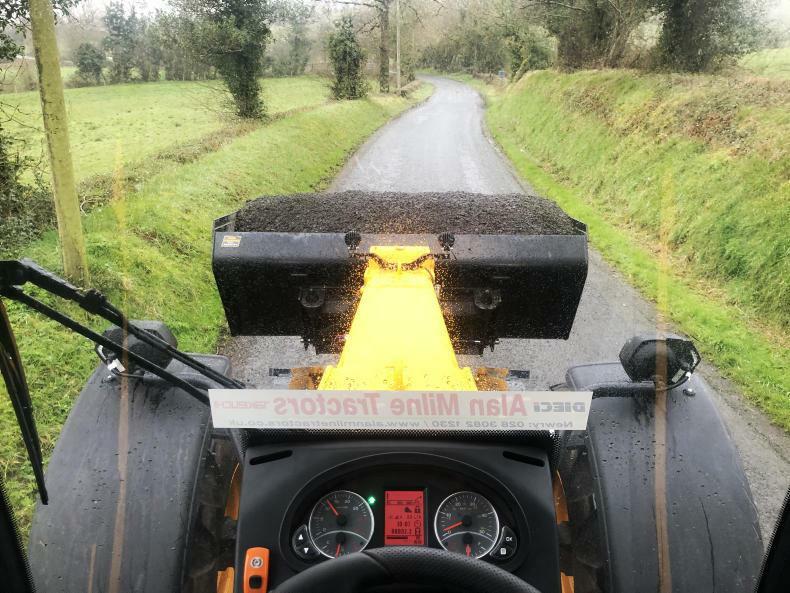 Irish agricultural contractors use models from the L60H right up to the larger L110H, with the L70H and the L90H being the most popular models in the range. When it comes to Volvo, the 173hp L70H and the 186hp L90H are the preferred models by Irish contractors. Volvo tends to use all of its own running gear such as engines, axles and transmissions. The L60H, L70H and L90H would be similar machines, each using the Volvo D6J engine and the same Volvo transmission and axles. The L110H is on a different level. It’s fitted with the larger Volvo D8J engine and a heavier duty drivetrain. Doosan is well-known for manufacturing heavy duty wheel loaders for the construction and quarrying industry, but not for agriculture. However, the firm has recently introduced a new series which is specifically designed for agriculture. The DL280-5 is powered by a six-cylinder common rail Doosan DL06 engine. Doosan will be introducing the 172hp ag spec DL280-5 into the Irish market this year. It has a list price of €145,000 plus VAT. This 5.9l engine has a rated power of 172hp. This engine is Tier 4-compliant using DOC and SCR. The wheel loader has a ZF automatic power-shift torque converter transmission. This transmission is fitted with four gears and three drive modes. The loader has an operational weight of 15,682kg. DGM machinery was set up by Damian and Diane Goff in 2014. DGM is an Irish-owned brand and registered trademark. The company informed the Irish Farmers Journal that it outsources its manufacturing to two factories in China. 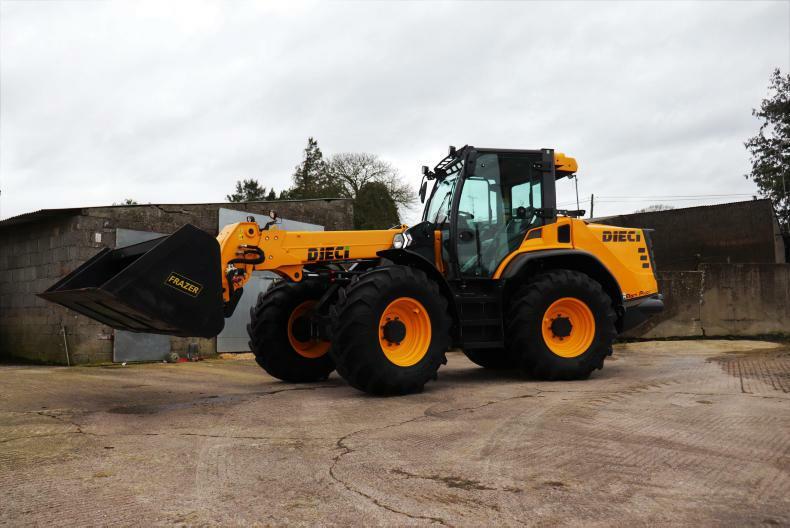 This 220hp DGM wheel loader on 750 ag tyres would cost €90,000 plus VAT. 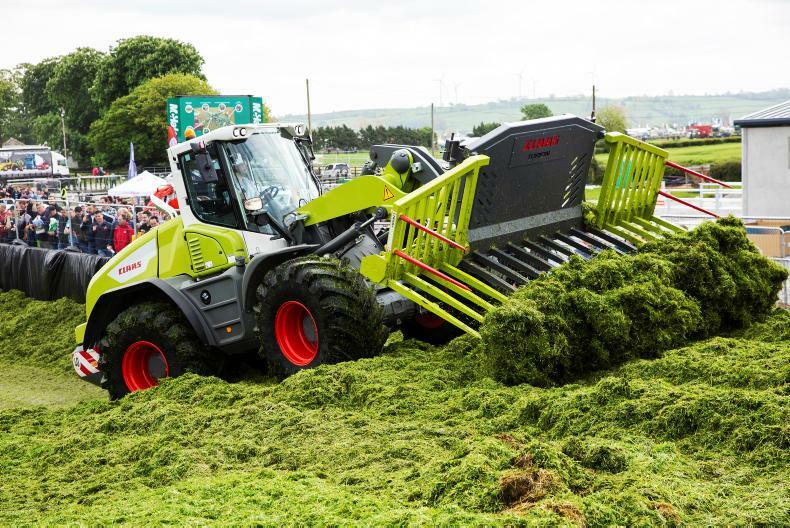 Although there are none of these machines working on Irish silage pits up to now, Damien has confirmed to the Irish Farmers Journal that he has sold one to an agricultural contractor in Co Meath who will be using the machine for silage. 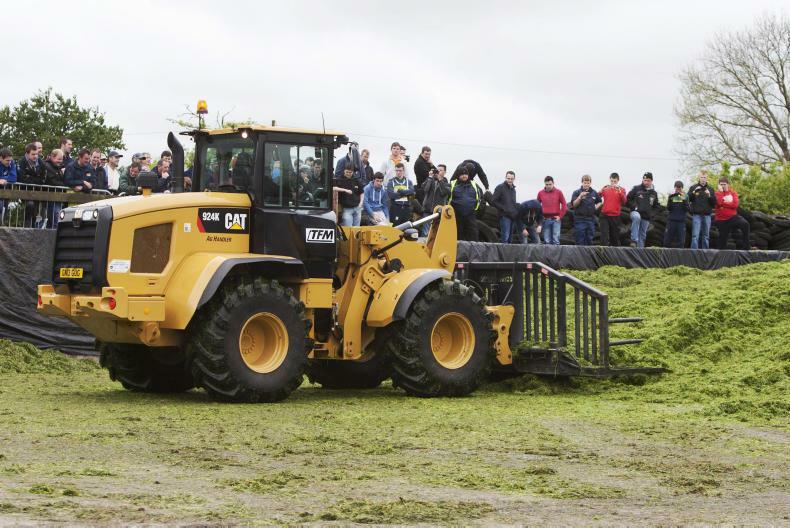 The silage-spec loader in question is an 18t machine powered by a six-cylinder 220hp Cummins engine and it has a four-speed ZF transmission. 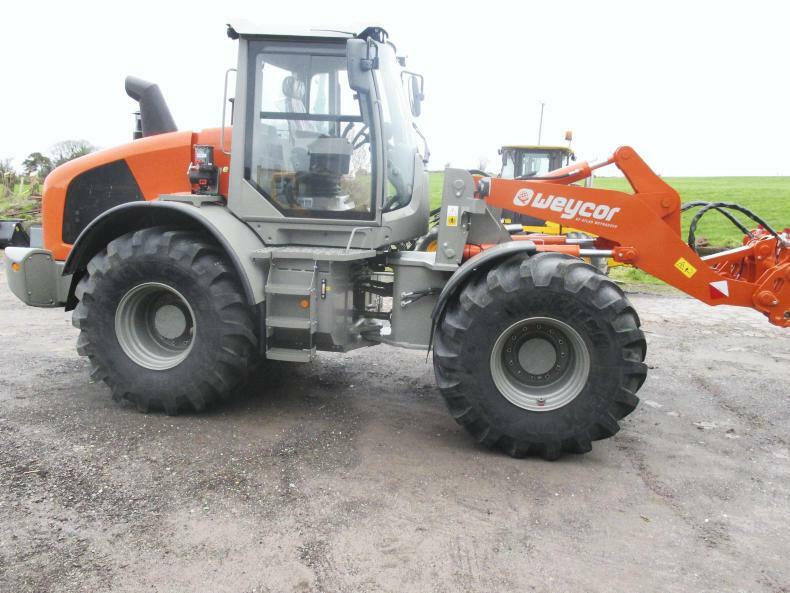 Sitting on agricultural spec 750 tyres, this machine is very competitively priced at €90,000 plus VAT. Once distributed through a dealer network, CAT machines are now solely distributed throughout Ireland by Finning. CAT’s answer to the Irish contractor’s needs is the 926M Agri. This wheel loader is built by CAT using almost all of their own components including their own engine, axles and transmission. The loader is powered by a 7.1l engine capable of turning out 166hp. 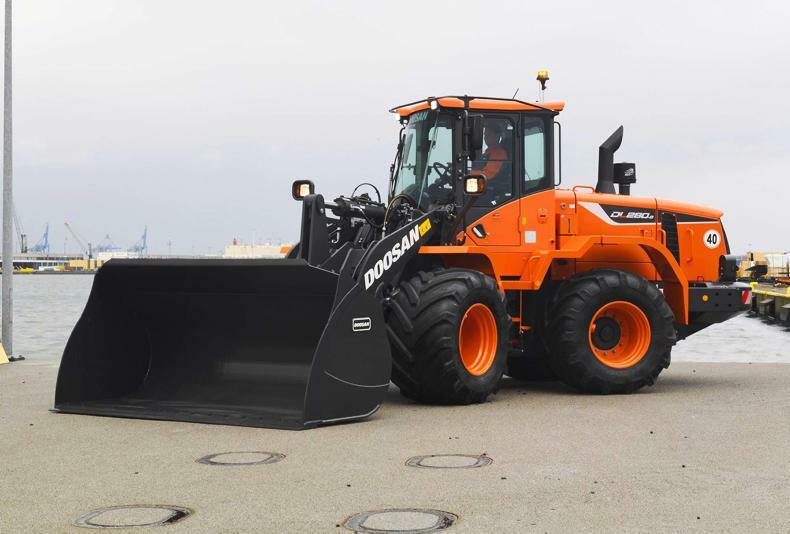 Weighing in at 13,500kg, the loader is equipped with a four-speed transmission with a maximum road speed of 40km/h. Best-known in Irish machinery circles for its grassland equipment, Pöttinger has been manufacturing a range of tillage equipment since 1975. This venture was first initiated when Pöttinger purchased the Landsberg plough. Here, we take a look at the company’s latest innovations on the tillage side of the business. The plough still plays a pivotal role on many farms in Ireland. Pöttinger recently introduced the new mounted Servo 45 M series, which will sit in between the smaller Servo 35S and the larger 45S. The latest ploughs have been developed for the 140hp to 240hp class. These mounted reversible ploughs will be available in four-, five- and six-furrow models. The ploughs are all offered as “Plus”, which includes hydraulic furrow width adjustment. The four- and five-furrow models will be offered as “Nova” and “Nova Plus” versions. The Nova models will have hydraulic trip legs and a triggering pressure of 1,900kg. 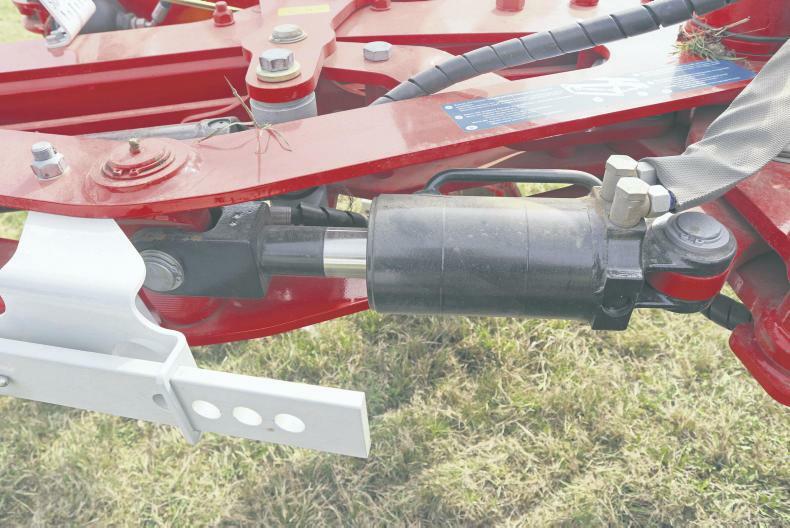 This hydraulic overload protection of the trip leg system offers an adjustable triggering to protect the plough. The new series is available with an inter-body spacing of 95cm or 102cm and an under-beam clearance of either 80cm or 90cm as an option. It also has less moving parts, all of which are now spring protected. Unlike previous Pöttinger ploughs, the alignment cylinder on the new series has no memory function. Instead, it uses a simple sequence, which Pöttinger claims is more reliable. Pöttinger says that its traction control expansion module enables the weight of the plough to be transferred to the tractor. As a result, Pöttinger says there is no need for ballast weight on the rear wheels of the tractor. The weight applied to the rear axle of the tractor is infinitely variable and can be adjusted hydraulically between 600kg and 1,500kg without leaving the cab. The 46W body on the Servo 45M means that it is suitable for tractors with 710 tyres. The plough has a higher headstock with four-fold adjustable through axles and four top-link positions. The 45M is equipped with the Servomatic control centre. It makes matching the plough to the tractor easier, with no fine adjustment needed. The furrow width of the first body and pulling point can be adjusted individually without affecting each of the other furrows. With the Servo Plus, hydraulic furrow width adjustment guarantees synchronisation of the first furrow width and the pulling point. On the Plus and Nova Plus versions, an optional hydraulic frame pivoting system is available, which Pöttinger recommends for the five- and six-furrow ploughs. This allows for a tighter rotation funnel for higher ground clearance when reversing, and a lower load on tractor and plough. The turnover shaft on the headstock of the Servo 45M has a diameter of 130mm while the beam link is a casting, rather than being welded. Pöttinger claims that this new design from the headstock to the reversing unit and plough beam tube increases the bending resistance by up to 25%. The new plough series has a reduced number of greasing points in comparison to the previous series. The replaceable bar points now feature armouring as standard. The ploughs are available with a selection of mouldboards, from short turning to long drawn-out furrow bodies to slatted mouldboards. Pöttinger’s Multiline concept combines either the disc harrow or stubble cultivator with a seed drill, while both machines can also be used individually. These machines are available in working widths of 3m and 4m and come with Pöttinger’s new tyre packer. The tyre packer is used to raise the combination drill through a double-acting remote valve, raising to a ground clearance of 27cm. Either the Vitasem or Aerosem seed drills can be attached or detached to the disc harrow or stubble cultivator. The Terrasem drill offers direct fertilisation for the precision application of fertiliser and seed in a single pass. The Terrasem is equipped with Pöttinger’s new intelligent distribution system (IDS). This features a seed return system using a patented funnel system back into the air stream. IDS allows each coulter pipe to be switched individually, which automatically reduces the seed rate in the metering system during tramlining and half-width drilling. The excess seed is then returned to the riser tube via a funnel system. Fertiliser is applied on the Terrasem using the Dual-Disc coulter. This method involves depositing fertiliser between each double row using the coulters on the disc harrow integrated into the Terrasem seed drill. The placement depth of the fertiliser can be adjusted independently of cultivating and sowing depth. 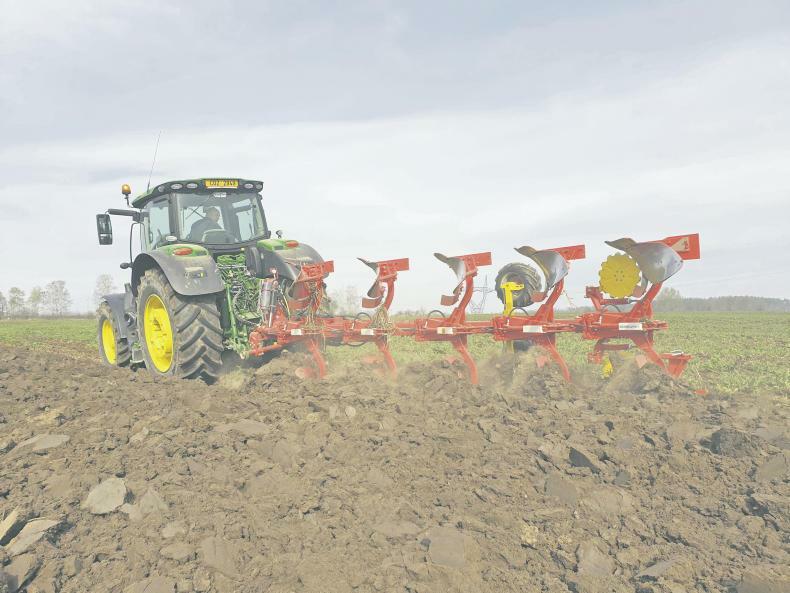 Although Ireland will most likely never be a big market for Pöttinger’s new 8m and 10m disc harrows, it’s worth mentioning that it is one of the first Isobus-compatible disc harrows on the market. Pöttinger is using the new Expert 75 Isobus terminal, a touchscreen terminal with a scroll wheel that can be used with all Isobus-compatible machines. The Terradisc offers a choice of working depths from 5cm to 15cm. It uses a twin-arm system, where two forged carrier arms are welded to the clamping bracket. Dieci is a brand that’s been around for some time now. 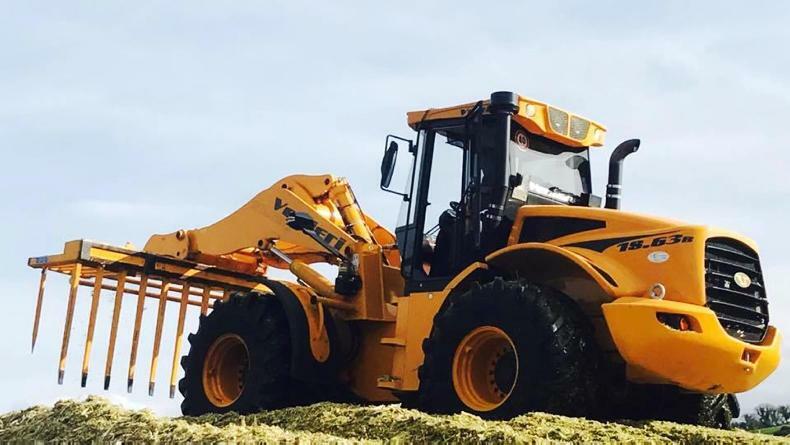 The Italian-built telehandlers are a common sight in the construction industry, but in recent times the firm has invested heavily in agricultural articulated wheel-loader markets. Since rebranding its agricultural range, improvements were made in terms of machine aesthetics and in other areas following operator feeback. Dieci’s articulated loader series, the Agri Pivot, consists of six models starting with the 46hp T40 all the way up to the 153hp T90. At first glance, the Deici T80 is a well-built, good-looking loader, weighing in at almost 8,000kg. 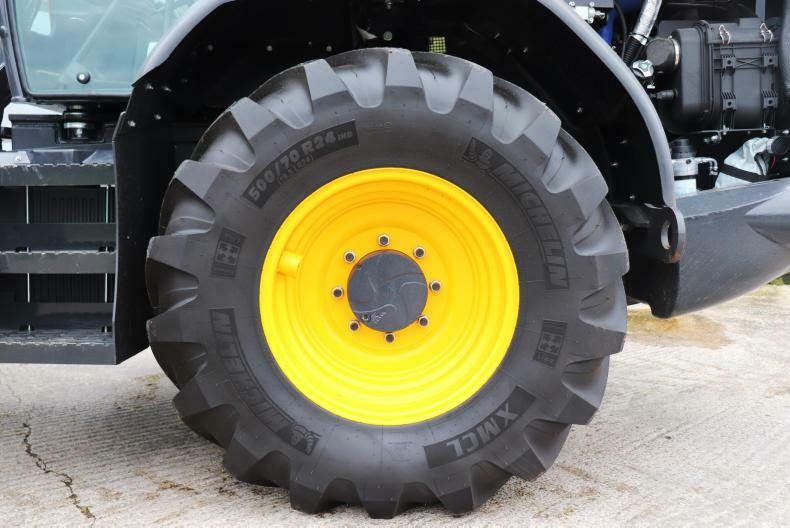 The model that we tested was shod on 500/70 R24 Michelin XMCL tyres, giving the loader a beefy look. The loader was fiitted with 500/70 R24 Michelin XMCL tyres. The boom section looks neat due to the fact the boom extension ram is internally mounted. A low boom pivot adds to its impressive cab visibility, with a strong chassis construction, especially around the central articulating pivot of the machine. All lubrication points are easily accessed. The T80’s cab is easy to get in to, thanks to its large steps, although each step is directly under the one previous, making it easy to miss the step when climbing out of the cab. The T80 is fitted with a four-cylinder FPT engine. This lively water-cooled FPT power plant is mounted on an in-line configuration and is capable of churning out a respectable 129hp (96kW) with a peak power output of 143hp (107kW), on par with its closest rivals. Stage IV standards are met by means of DOC, SCR and DEF. The T80 is driven by a two-stage hydrostatic OMSI transmission, as are all members of Dieci’s T series. Having a maximum speed of 36km/h leaves the T80 slightly behind on the road, when compared with some of the other contenders on the market. 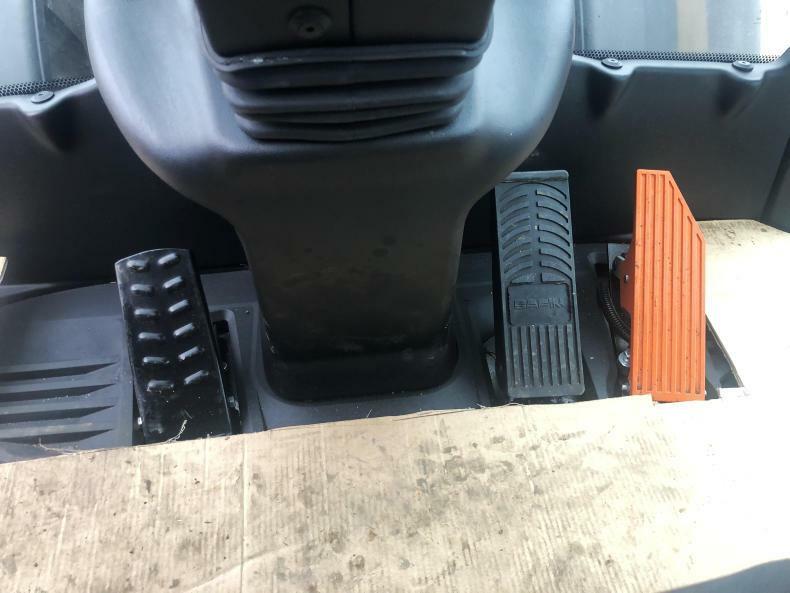 An inching pedal located to the left of the steering column allows the operator to take control of wheel speed and increase hydraulic oil flow. 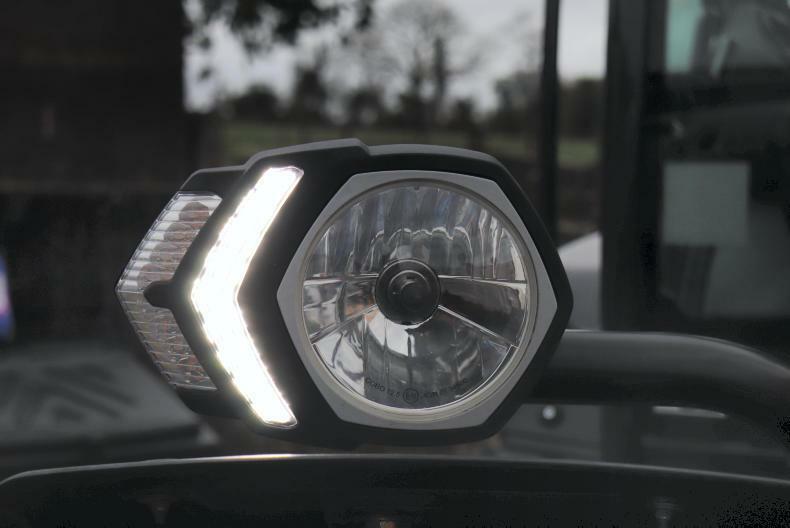 Daytime running lights are a nice modern touch to the loader. Initially acting as a brake, it proportionally disengages the transmission depending on the force applied, allowing engine speed to increase or decrease. This speeds up or slows down oil flow to its hydraulics without disengaging forward or reverse gears. The loader is seated on two rigid Italian-built Spicer axles, both with four planetary reduction gears and limited slip differentials (LSD). Its front axle is self-locking, while the rear axle can oscillate up to 25°, for improved operator comfort across uneven terrain. Both axles see servo brakes submersed in an oil bath and during our review we found that the brakes only became properly effective once pressed almost completely to the floor. From left to right is the inching pedal, brake and accelerator. Load-sensing power steering allows the T80’s articulated chassis to turn to a total angle of 80°. The T80 comes fitted with Bosch Rexroth hydraulics. Its gear pump has a capacity of 114l/min, controlling both steering and hydraulics. This arrangement gives the loader a maximum lift capacity of 3,500kg and a respectable maximum lift height of 5.20m (17ft). Boom suspension can be turned on or off using the overhead rocker switch, leaving road travelling that bit more comfortable. Visibility is good towards the front and sides, while rear view is hindered slightly due to its large rear end. The opening roof window allows a satisfactory view when viewing the boom in its fully raised position. The cab feels airy and lets in good light. During our review, the wet weather caused the windows to fog up, which proved hard to shift with the heating system, especially in the centre of the windscreen. Room within the engine bay is limited, a large amount of space is taken up by exhaust gas treatment equipment. Opening the roof window allowed a small amount of rain in, but cleared the windows quickly. Layout of controls is simple yet effective. Alan Milne, Newry, Co Down, (www.alanmilnetractors.co.uk), imports these loaders with a high level of spec as standard. This includes an air seat, LED lights, rear auxiliaries and air conditioning. The armrest is retractable leaving easy access out the right-hand-side door. The T80’s two daytime running lights are a nice feature, making the loader visible from a distance on the road. The full LED light package makes late-night jobs that bit easier. 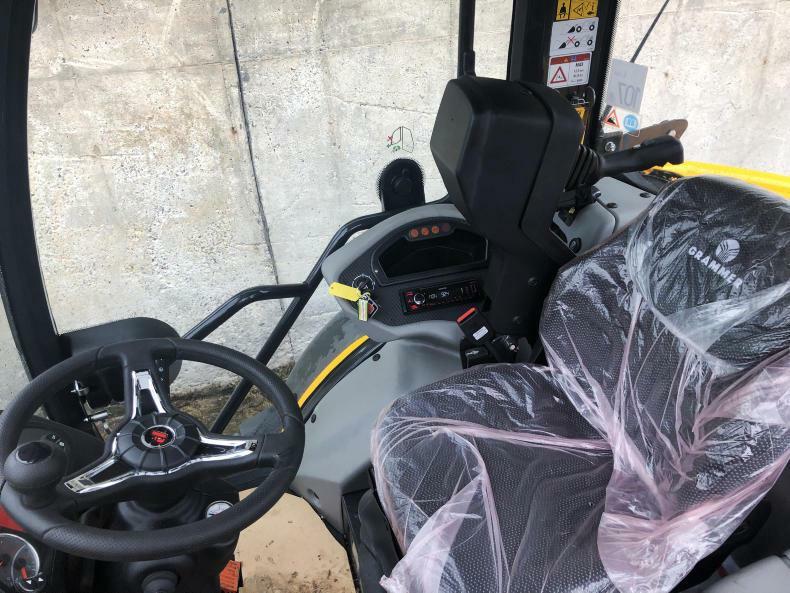 The adjustable steering column adds to ease of access, and also has an emergency stop button that, once pressed, kills the entire loader. The armrest-mounted joystick feels nice in hand and has a sensor built in to detect the presence of a hand. If the joystick’s built-in sensor is not engaged, the joystick remains inactive, having no hydraulic response to movement. Once a hand is placed on the joystick, the sensor is engaged, making it active. This is a nice safety feature to protect the operator if they hit off the joystick when entering or exiting the cab. The joystick has three proportional roller switches, controlling boom extension, forward and reverse directions, while neutral is selected by pressing the orange N button. The rear-roller switch controls auxiliary oil flow, or the locking and unlocking of attachments if the armrest mounted rocker switch is pressed. Other switches found on the panel to the right of the operator include an engine rev pre-set switch, acting somewhat like a hand throttle for stationary work. A key switch is also present, which makes adjustments to the hydraulic system to suit buckets or implements such as pallet forks depending on key position. Visibilty from the loader is good with no obstructions from the boom. The complete armrest retracts, allowing the operator to exit via the right-hand door easily. The door latch has a small bracket to hold the door in place, while still open roughly 3in to allow airflow throughout the cabin. The T80’s 140l diesel tank is located underneath the bonnet as well as the isolator switch, while the 27l AdBlue tank is situated behind the cab step. There is a lot of confinement beneath the bonnet. Filters appear to be hard to reach from a maintenance point of view, although this is manageable. Good visibility of the pin and cone headstock make implement attachment easy. The loader’s right-hand steps are built into the hydraulic oil tank, making oil level easy to check through the large sight glass. The T80 performed well. Its hydrostatic transmission worked well around the yard, range one being used solely for yard work but moving into range two for faster speeds and road travelling. Its transmission proved responsive, reaching top speed quickly. Approaching hills saw forward speed decrease dramatically and engine revs increase, as the loader would climb at a much steadier speed. The T80 has a maximum reach of 5.2m. This proves to be a general trait of any hydrostatic transmission when compared to a powershift transmission. The T80’s hydraulics were responsive, having a good ability to flick the bucket or to flick grass on a silage pit if put to the task. Having the inching pedal on standby for extra oil flow when needed is surely a feature you’d find difficult to do without. Even for tasks like loading the mixer wagon, I found myself using the pedal when tipping the bucket to hold the loader. Lifting full buckets while the loader wasn’t in line left the loader feeling a little unstable on uneven terrain. Having said all this, the T80 really did prove to be a nimble machine around the yard, making light work of general yard duties such as feeding and handling dung. Fuel consumption seemed average, which would be expected to improve as the loader had only 25hrs on the clock. 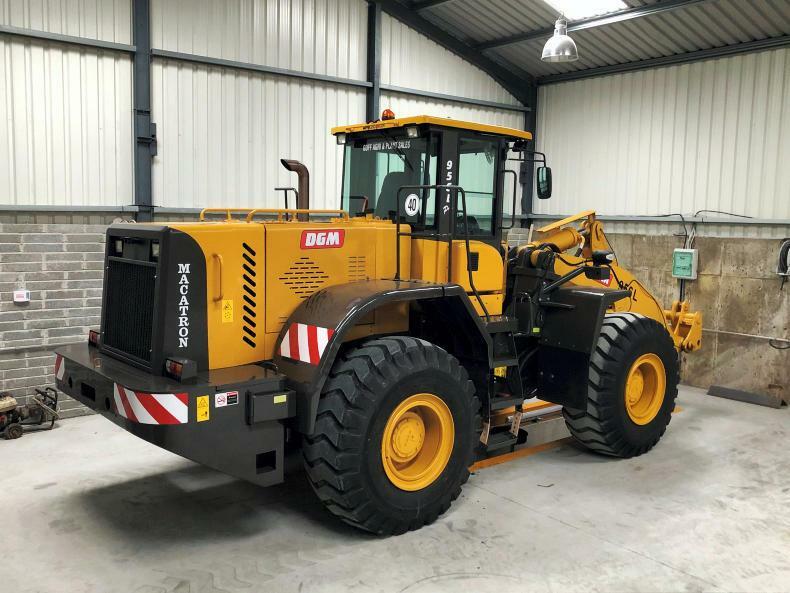 It is clear from having used this machine that Dieci is a serious market contender, having listened to feedback and improved aspects of its machines over the years. The T80 loading the mixer wagon. Good visibility from the driver’s seat. Ability to easily enter the cab using either door. Its cab may not be as refined as others on the market. Maintenance points such as oil and diesel filters seem a little hard to access. Braking required pushing the pedal almost flat to the floor. Engine: FPT, four-cylinder engine producing a peak output of 143hp (107kW). Transmission: OMSI hydrostatic with two servo-tcontrolled gears, max speed 36km/h. Hydraulics: 114l/min geared hydraulic pump. Fuel tank capacity: 120 litres. List Price: €108,000 including VAT. 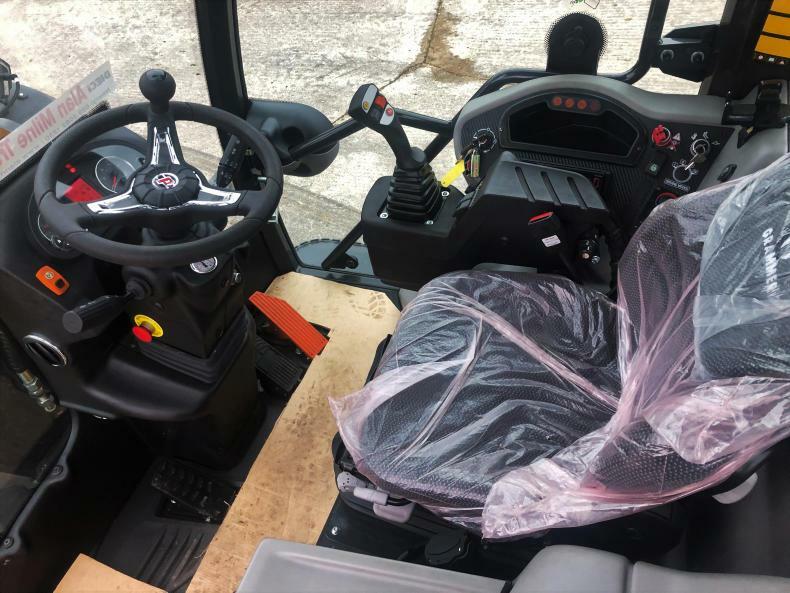 The T80 has a spacious cab with good control layout. It is estimated that there are more than 4,000 agricultural contractors scattered throughout the island of Ireland. 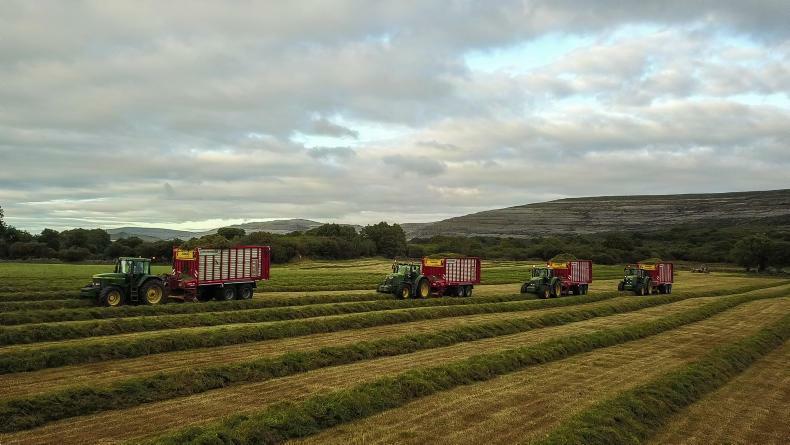 Irish conditions, particularly along the west with dense and often wet swaths, sometimes on marginal ground, are known by machinery manufacturers worldwide as being some of the toughest for operating grassland machinery. 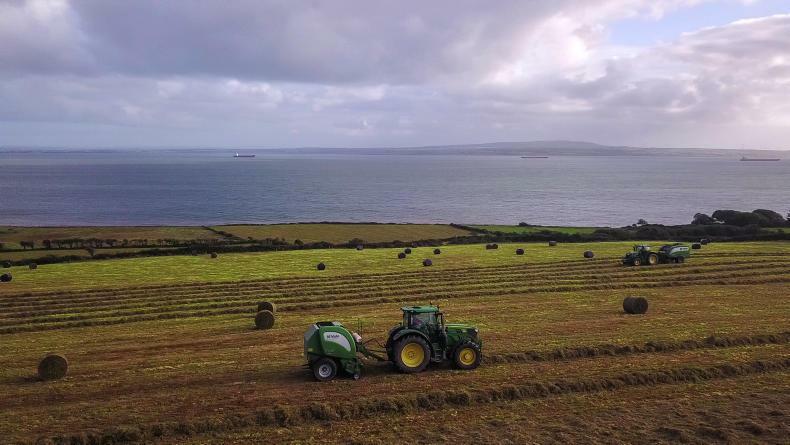 We visited Brian Carey, an agricultural contractor with an impressive fleet of machinery based less than 800m from the Atlantic coast. Brian said operating a contracting business in west Clare has a lot of challenges, but he wouldn’t change what he does for anything. Because he is based on the coast, he has to travel great distances to get through a large workload. His team travel up to 40 miles north of his base to cut silage. Your typical Irish contractor would travel within 10 miles of their base. Another distinguishing feature of Brian’s operation is that his fleet of machinery rarely returns to the home yard during the busy silage season. He said that when they move into different areas they tend to leave the machines in farmers’ yards overnight instead of bringing them back. A diesel lorry then calls to these yards to fill up the tanks. Brian said he works on the worst of ground but he has the best of customers. However, running machines on marginal ground has its challenges. Brian runs one of the largest fleets of forage wagons in the country. He first got into pit silage in 2003, and now operates five PÖttinger Jumbo wagons. He has tested a number of self-propelled forage harvesters and seriously considered changing his system over the years, but he decided to stick with a fleet of forage wagons for a number of reasons. Firstly, the running costs of the wagons are very low, averaging around €1,500 per year in his experience. Secondly, he carries out a lot of silage harvesting on very marginal ground and in small fields. He feels his wagons, which run on 710 flotation tyres, will do less damage on the run of the mill than a large high-output forager as the drivers can pick and choose where to travel and where to load up the wagons. He added that if he had a silage harvester in these small fields with four or five trailers, it might result in some of the trailers being static from time to time. 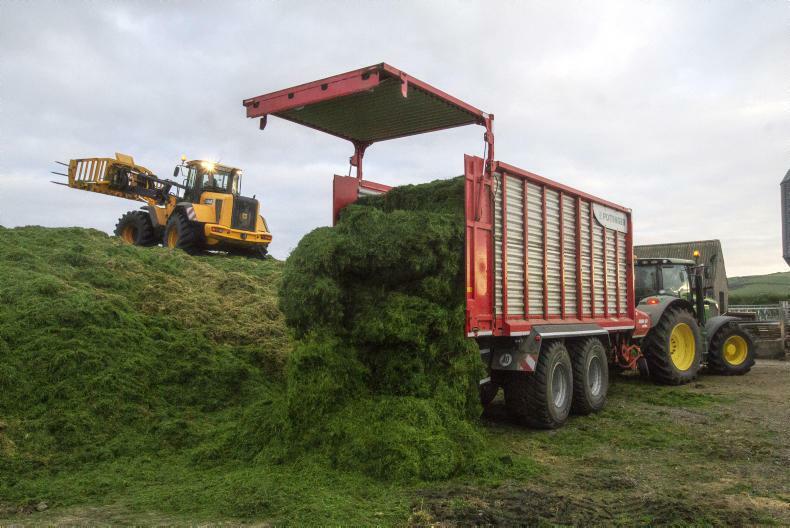 With the forage wagons he likes to send them to various different fields on one job, providing a steady flow of grass to the loader driver on the pit. Brian’s average cut is 30 to 40 acres. He feels the wagons suit his system. As he has two loading shovels, he can send one, two or three wagons to one job and one or two wagons to another job, meaning two farmers are getting their silage cut at the same time as opposed to one if he had a forager. Brian felt the only downside of running five wagons is that he needs to have five very capable drivers. However, he said he’s lucky to have the same drivers on these machines each year. Brian said he started off running PÖttinger wagons in 2003. He said he’s tried out the various brands on the market but he feels for his operation the PÖttinger machines have the edge. He trades in one wagon each year for a new one, meaning no wagon in the fleet goes beyond five seasons before being upgraded. The contracting fleet consists of 12 John Deere tractors. Brian runs John Deeres for two reasons, reliability and dealer backup. Starting off with a pristine John Deere 7710, his fleet includes 20 series, 30 series and the modern M and R series tractors. Brian said his favourite tractors would be his two 6920s. He explained they’ve put in thousands of hours of hard work and had low running costs, with no major issues. Brian has adopted a system in his contracting business where the same person drives the same tractor the whole time. If this tractor is then traded in against a new tractor, the driver will be upgraded to the new tractor. This means that each driver is solely responsible for looking after their assigned tractor. To keep the grass shifted from the five wagons, Brian runs two JCB wheel loaders, a 414s and a 435s. First starting off with a JCB 412s, Brian stuck with JCB down through the years. Last year he traded in his 2008 JCB 434s for a 2016 JCB 435s. He said the newer machine is more comfortable on the road, but he’s still not convinced it’s as good as his previous 434s on the pit. Brian feels one of the biggest challenges for all contractors is the consistent increase in new machinery prices. He explained that in 2013 he bought a new John Deere 6170M and the same tractor in today’s market would cost an additional €25,000 plus VAT. He said rates for work are not increasing to match these significant machinery price hikes. Brian believes that with the ageing farmer profile in his area, there are going to be big changes in the farming sector over the coming years. He said: “I sometimes wonder will the work be there in the coming years. There are not enough young farmers coming through in our local area. It’s worrying when contractors are signing themselves into five-year finance contracts”. Another challenge running a contracting business alongside the coastline is the exposure of the machinery to the salty air. Brian needs to thoroughly steam-wash the machines at the end of the season, spray them with an oil to preserve the paintwork and tuck them away in a shed. The most unusual issue that Brian’s team often have to face in the summer months is the tourist traffic on the small roads. Brian is lucky to generally have the same guys working for him year in, year out. This consists of some part-time local farmers who drive for the summer months and a number of full-time staff.